It was a cloudy Tuesday morning on the second day of spring break. 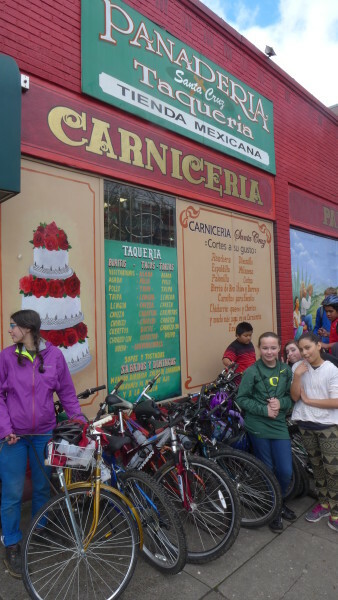 While most students were nestled in their beds, the Cesar Chavez Bike Club crew arrived at 9:30am for their 4th week of Bike Club. 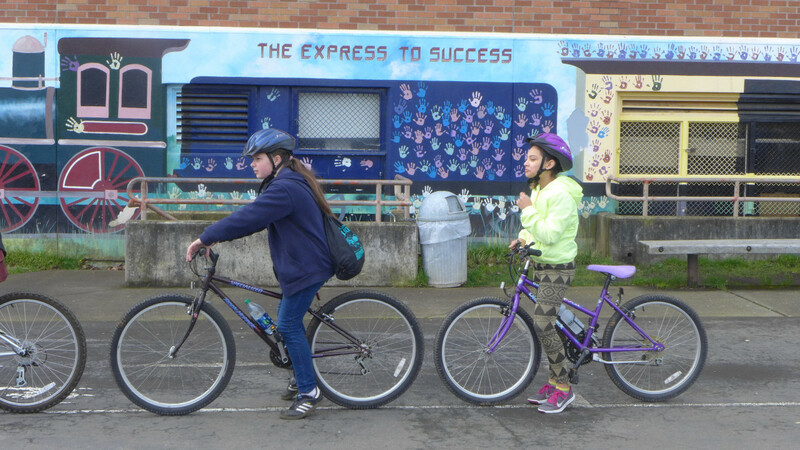 Prior to Tuesday, the students learned about the importance of helmets, hand signals, bike safety checks, and all of the necessary road knowledge to ride safely. But, in the last few weeks they only practiced these newfound skills within the confines of the schoolyard and a quick ride over to a neighboring park. On this day, they put these skills to the test with their first longer ride around Portsmouth and St. Johns. “Check the tire pressure!” All at once, every student squeezed their tires to confirm whether or not they were “squishy.” Next, they clutched their brakes, wiggled their handlebars, hand-pedaled to test out the chain and gears, and finally confirmed that their saddles were the appropriate height. “My seat is wobbly!” explained Javiera. Lily quickly handed her a multi-tool and they tightened it together. Next up, the students practiced riding in a straight line and in pods around the basketball courts. With such a large group, it can often take multiple rounds of stoplights for the entire group to pass through an intersection. By riding in pods, or two people side-by-side, it can help create a more efficient ride. 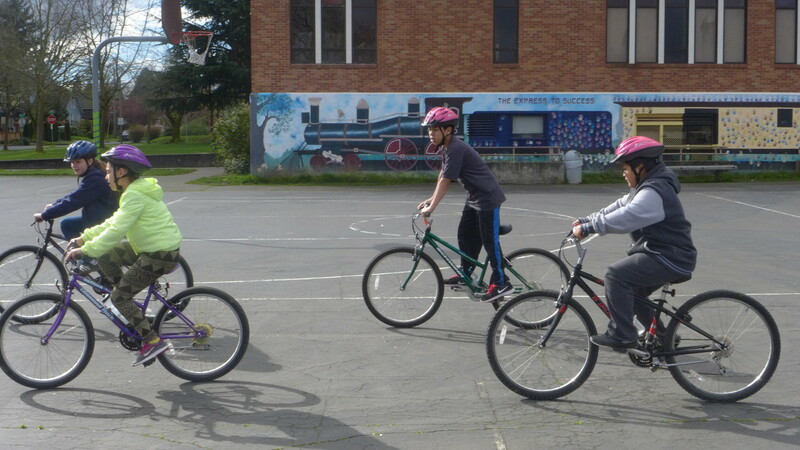 After performing a bike safety check, they completed the personal safety check together. Helmets were adjusted, shoelaces were tied, jackets were stuffed into backpacks, loose pants were tucked into socks, and awkward satchels and bags were placed into school storage. The students were visibly ready and eager to get on the road. It is fun to navigate the back streets of Portsmouth and St. Johns with such a large group of middle schoolers. Adult cyclists on the road waved to us and smiled, dogs barked as we rode near their homes, cars let out a friendly honk and slowed down as they passed us at a safe distance. 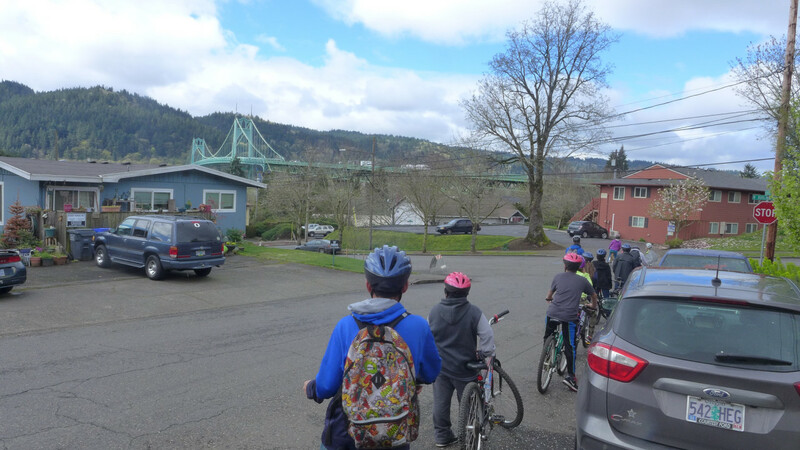 As we approached Burlington Avenue, a two-way intersection, the students practiced their left-turn hand signal, shoulder-checked to look for cars, and moved into “gear 7” as they went down their first steep hill. With the bright green St. Johns’ Bridge in the distance, we knew we were close to our first park break. 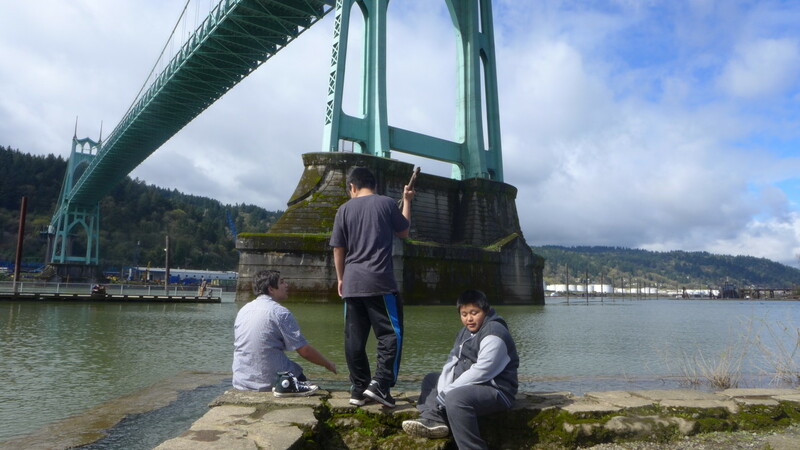 We arrived at Cathedral Park and Noah, Donovan, Adan, and Christian quickly went down to the beach. Noah informed Christian that his great-great-grandfather swam across the Willamette River. “I’m very native,” he explained. “He’s strong. He plays hockey!” explained his friend Adan. We finally arrived at Santa Cruz and placed an enormous order of tacos and horchata. “After this can we go to Mount Hood with the bikes?” asked Adan. 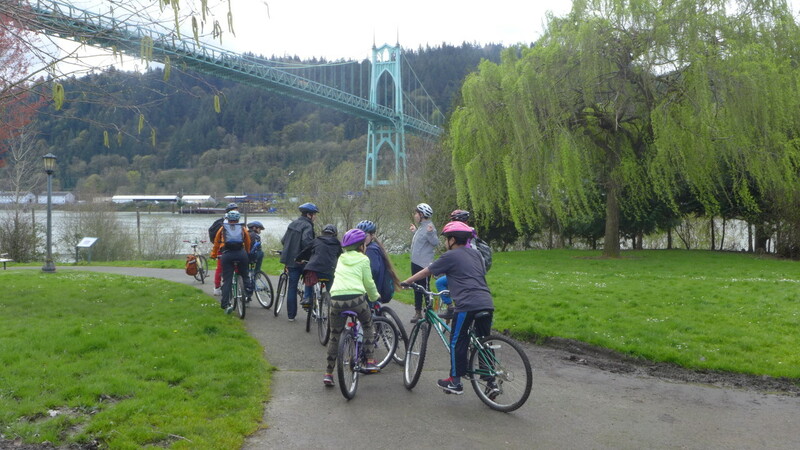 This season of Bike Club was made possible thanks to support from Portland Bureau of Transportation’s Safe Routes to School.